DRPU Gate Pass ID Cards Maker & Visitors Management Software allows you to design visitor's ID card and Gate pass for your visitors. 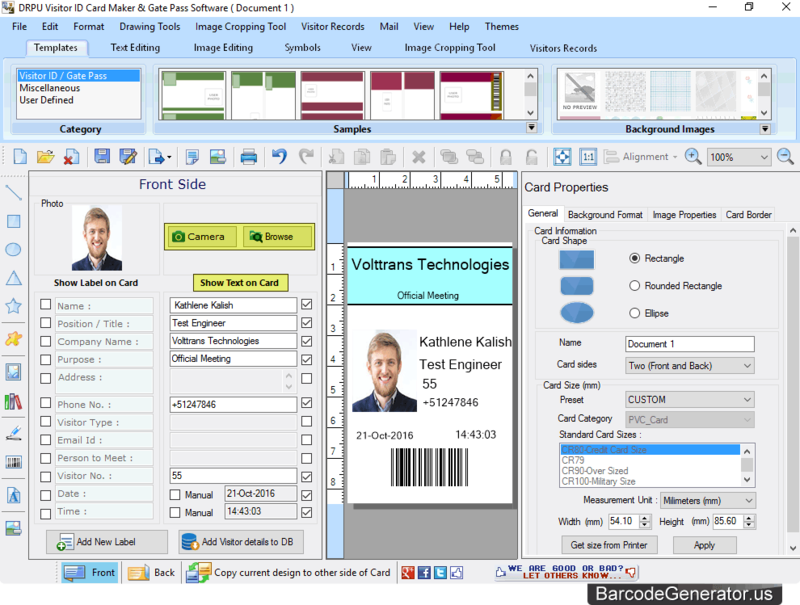 Software is having Pre-defined templates to quickly design visitor ID Cards or Gate Pass. Software provides option to add all visitor's details to the database. You can also search visitor's records according to Name, Company Name, Date Range etc. as per your requirements. Software is inbuilt with Camera feature to take photo of visitor and crop as per your requirements using 'Image Cropping Tool' option. 'Export' feature is also available in software, So that you can easily export Visitor ID Card as image(png, jpeg etc.) and as PDF file format. 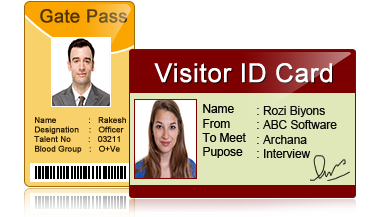 Designed 'Visitor ID Card' using 'DRPU Visitor ID Card and Gate Pass Maker Software". Save Visitor's Records & Export in Excel: You can save visitor's records and also export visitor's records in Excel file. Print Designed ID Cards: Option to print your designed ID cards using advance print settings. Image Cropping Tool: Cropping option is also available to crop a single image or multiple images for your ID Card. Add visitor's details to the database: Software provides option to add all-relevant information about the visitor to the database. Export designed ID Card: You can Export designed visitor ID card as Image (JPEG, PNG etc. ), as PDF and as Template. Camera Setting: You can take pictures using Camera, while designing ID Card. Copy Card Design: Software is having an option to copy current design of ID card to the other side of card. Design using Pre-defined Templates: You can design ID card by choosing pre-defined templates as per your choice.